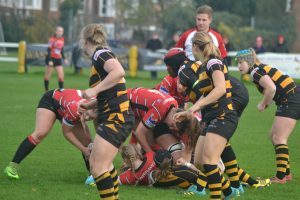 Wasps produced some outstanding rugby in the first half at Twyford Avenue to put themselves out of reach of Gloucester-Hartpury. Despite a ferocious fightback from the visitors, Wasps resolute defence held firm to seal a 26-10 victory against another play-off contender. Wasps looked dangerous in the opening encounters, with outstanding handling despite bitterly cold conditions. The first score came from a brilliant first phase move, as a great wrap around and dummy from Lizzie Goulden created a gap for Kendall Templeman to dart through under the posts. 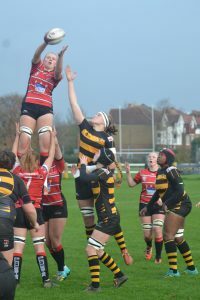 After a tight middle period of the first half, Wasps worked themselves into a strong position. Kate Hallett finishing a strong driving maul to extend the lead. Wasps pressed on with two more scores before the half. After another dominant scrum for the hosts, excellent ball retention gave Kate Hallett her second score of the day. 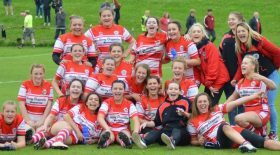 The final score was the result of a fantastic cross-field kick and great offloading which saw Kate Alder race away. The hosts leading 26-0 at the break. Gloucester initiated a powerful second half fightback on the 50-minute mark. 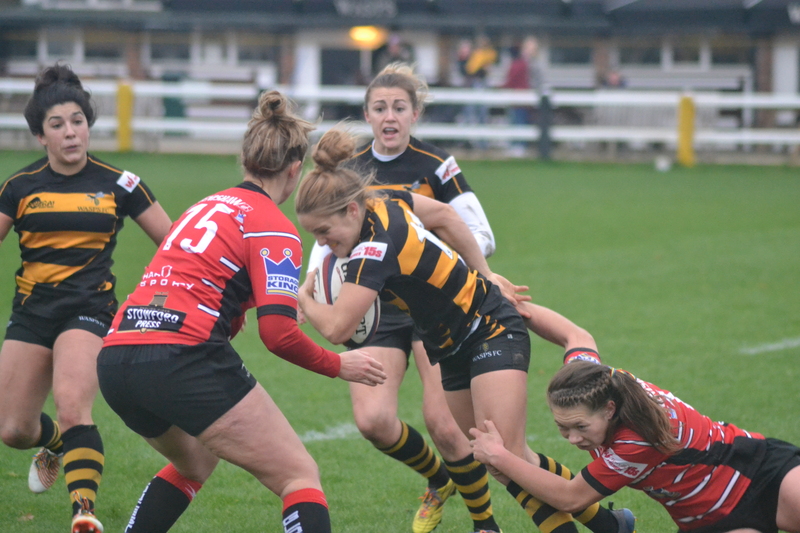 After a long spell inside the Wasps 22m, a strong scrum from the visitors saw Sian Williams dot the ball down at the base. Gloucester scored again shortly afterwards going wide for Sophie Tandy to race into the corner. Despite constant pressure from the visitors for the remainder of the game, Wasps resolute defence kept Gloucester at bay. It could prove a vital victory for Wasps at home to another side in play-off contention. They proved to be a real threat with ball in hand, playing some champagne rugby in the first half. Their defence was equally as important in the second half, keeping a hugely threatening Gloucester side to two tries.